Chasing a small target of 218 runs, the Indians found themselves in a dilemma as they lost 4 wickets in quick succession. Team India picked up yet another victory at the island nation in the 3rd ODI international against the hosts. Miseries seem to pile upon the Sri Lankan team with each passing day and the fans seem to have lost their cool. We saw another example of the same when the fans decided to express their anger when they threw water bottles on the ground which interrupted the on-field action. 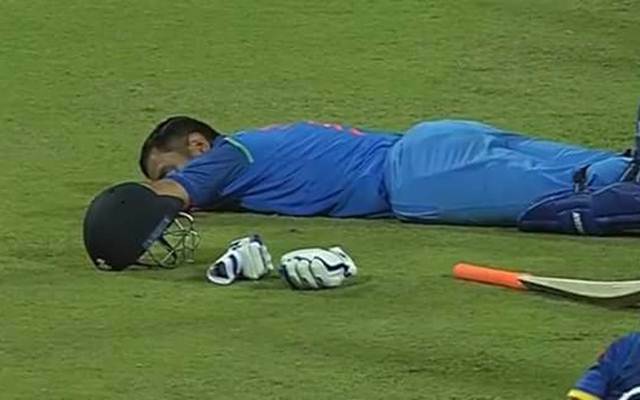 Team India were 8 runs short of the Sri Lankan target of 218 runs, and active batsman MS Dhoni decided to utilize the break by taking a nap on the ground. It was just another moment when the former skipper gave us an example of his coolness. However, Dhoni took his team over the line when play was resumed. Chasing a small target of 218 runs, the Indians found themselves in a dilemma as they lost 4 wickets in quick succession. Opener Rohit Sharma took the responsibility and stormed back to form with a brilliant century to revive the Indian inning. Mahendra Singh Dhoni acted as a pillar of support to the flamboyant stroke player which saw the team emerge victoriously in the 46th over. Rohit Sharma remained unbeaten at a score 124 runs from 145 balls while MS Dhoni played a calm and composed knock of 65 from 86 deliveries. Having lost the first 3 One Day Internationals, the Lions now need to win the two remaining ODIs to ensure automatic qualification for the ICC World Cup in 2019. Considering the dismal form of the batsmen, it seems highly unlikely that Sri Lanka will manage to do so. However, this was not the first time in the series that the fans made their feelings public. After the loss in the first ODI, the fans surrounded the SLC office and hurled abuses at them. They also shouted at the Sri Lankan team bus even before the players could board them.